This is the detail of the news item you clicked on. Expires 2018-03-29 LENT 2018: The season of Lent begins on Ash Wednesday, 14th February. The Ash Wednesday service for our Union of Parishes will be at 8.00pm in Cashel Cathedral. This year we shall be running our Lenten Evenings "Who are we?.....Where are we going?" on the Mondays of Lent at 8.00pm, commencing in the Cathedral on Monday 19th February. 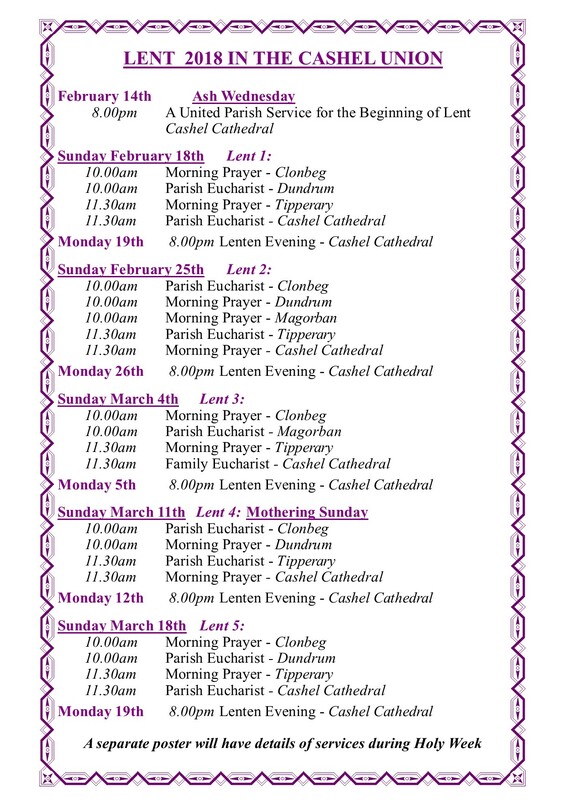 Why not clear these evenings in your diary, and make them part of your Lenten spiritual journey?